Lord we do want the higher ground. We don’t want to be kept down in the lower realm Lord. Lord, we have heard a Word of challenge to come up to bring the soul up into the higher heavenly realm: out of the realms of hell; out of the realms of earth; that we might come into heavenly places in Christ Jesus. So that is our hearts cry today Lord. Let it be the heart cry of Your corporate people Lord, of Your house. Hallelujah. Let our Word come forth from thee. We pray You take control in the mighty name of Jesus. Hallelujah. Amen. It was in what we would call by our modern calendar, the first month of the eleventh year of the new millennium on the eighteenth day of the month (January 18, 2011) that I had a dream. That has now been at least six months ago. It has not left me. It continues to trouble me. I have only talked about this in one other place. The Czech brethren that are here in the audience, if they can bear with me a little bit and maybe hear some new things that the Lord is saying to me about it. I am still seeking the Lord about it. First let me tell you what the dream was. Then let me take you to the Word of God. I wasn’t sure that everything in the dream was exactly the way it says in the Word of God, so I went to the Word to look and you can be the judge. It is a dream and I don’t usually preach dreams, but God is trying to say something to us. I have listened now this morning, I have listened this afternoon and I am convinced that God has a serious message for none other than the holy place church. This is not a message for the outer court. If you consider yourself holy place people, it is a message for you. The second thing is that I am convinced about having heard the two Words that have already been given, that God is not playing games. He is (so to speak) taking the gloves off and He is going to tell us exactly what our problem is. But He is not only telling us what our problem is, He is telling us what the answer to our problem is. Let me begin: In my dream I found myself in the holy place of the tabernacle of Moses. Yes, I was really there in my dream. It was quite dark in there. There was a little light that was coming in through the door which was opened a little bit. So there was a little light coming in from the outer court, being that it was outside. But I could see the priests. There was quite a gathering of priests in there. I don’t’ know how many there were there, but I could see their turbans, I could see their robes and I could see the look on their faces. As I approached I remember the one priest turned and he looked at me and I could read everything that was being said on his face. What the problem was and I could hear them discussing it. In the spirit I could hear them. What they were saying was that the lamps had gone out. They were not trying to cast blame as to whose fault is was, or who was supposed to be on duty, or who let it go out, or who did this, or who did that. That wasn’t what they were doing. The problem that they were trying to solve was: How do they get the lamps lit again? There was a procedure that they had to go through and it was only holy fire that they wanted to use. Let’s give them this; they only wanted the holy fire. They weren’t ready to do something that had been done in the outer court. It was also my understanding that the light of the original ignition of the fire of the outer court had already gone out. Therefore they could not go to the outer court again and take the fire from the outer court, which was the procedure that they ordinarily would have used. (I will read you all this in the Word here in a little bit.) They couldn’t get it from out there. Therefore insofar as the confines of the tabernacle itself, there was no more holy fire. However, the rules were, and this I cannot confirm from the Bible – this was just my dream, the rules were that you could not bring outside (unholy) fire in. That much I can confirm from the Bible. But there was apparently (at least in my dream) that you could take the holy fire out of the holy place. In other words, an individual priest could take that fire to his own home and he could have that fire in his lamps or whatever in his own house. But he couldn’t bring a strange fire that he had lit with a match (I know they didn’t have matches in those days) or flint or whatever ways they lit fires, and he could not bring that into the holy place. Can you understand what God is trying to say here? So the discussion was that there must be individual priests, (holy place people) that have this fire, that have it in their house and they are going to be the ones that are going to search for it that they might bring the life back into the house of God. Okay. Now as far as I know, that is the extent of my dream. Now let me go to the Word of God and I want to read what the Word of God says about the lamp and the lampstand. By the way brethren, I have never known this much about the lamp. Even reading The Pattern, I first went looking in The Pattern to find all of these details. But the details weren’t in The Pattern. It was just the overall picture and I had to go and look for myself and to see what it actually says in the Word. So let’s start in Exodus the 25th Chapter where we have an introduction to the lampstand. 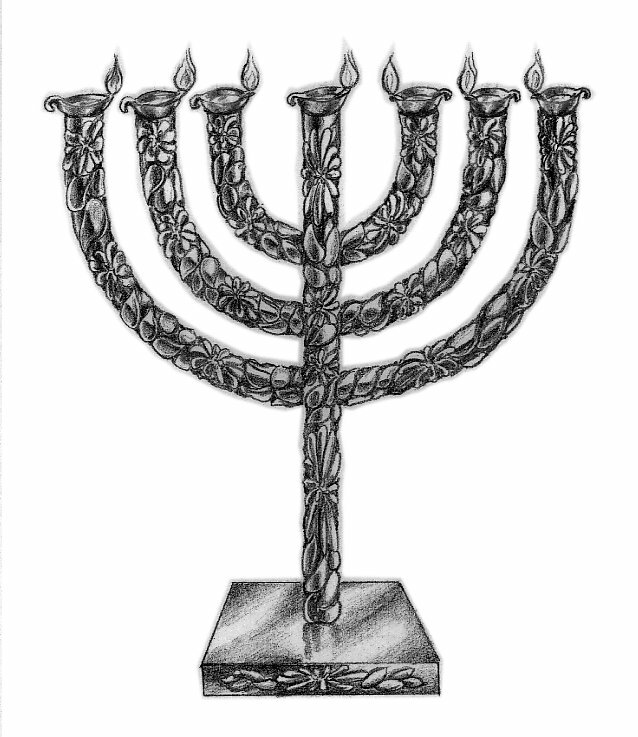 By the way, I’m reading from a King James Bible and do you understand that the word “candle” and “candlestick” are in the King James Bible but they are not in the original Hebrew translation? Cross those out wherever it appears. You hear me say that every time I read this. You are probably tired of hearing me say this, but I have looked it up in both Old Testament and New Testament and there is no such thing as a candle or a candlestick. It is not there. Look it up in the concordance: it is lamp and lampstand. Lamps have oil, candles do not have oil; they have paraffin and they don’t flow. Amen. Let me go and read right on down to verse 37. I’ll just finish with the next verse. Now, here we only see the construction and the making of the lamp. By the way, I could use the word “the manufacture” of the lamp. Do you know that the word “manufacture” actually means “handmade”? That is its original meaning, so it is handmade, made of pure gold. Everything by the way in the holy place, there is no wood that shows, it is pure gold that is the only thing that shows in the holy place. So this is the holy place church that we are talking about here now. You notice that the oil is beaten. Amen. We are talking about some suffering that comes about to produce the true anointing. All right. That means on this side of the veil, I am not on the other side of the veil yet. Okay. But on the holy place side of the veil is where the lamp was. The word burn is kind of an interesting word in that it means that it shall ascend. How many times are we hearing the word “ascend” here? It is supposed to rise up; it is supposed to go up higher. The burning of the lamp then is to ascend. Okay. This doesn’t sound like anything that is being turned out at night. We are not trying to save electricity. We are not trying to save oil. There is purpose here of keeping this light alive. It represents the Spirit of God and it is not to go out, it is not to go out at night and in particular it says “from evening to morning”. So that means that somebody has responsibility in the holy place, somebody among the priesthood, for keeping this lamp going even in time of darkness. Especially in time of darkness is when the lamp is to be kept burning. Okay. Perhaps not, because Moses tabernacle has passed away. But nevertheless, God said, this is the statute. I want it to continue on into the Twenty-First Century and thereon as long as it goes. I want this lamp to be kept burning, this lampstand with these seven lamps. Amen. Going a little further in Leviticus Chapter 24, we are going to go back and forth here between Leviticus and Exodus if you will bear with me for a minute. We are just looking for evidence. I am just giving you another witness here. God wanted it to burn continually. He wanted pure oil, pure beaten oil. Okay. Not something mixed up with canola or peanut or corn oil or something else. He wanted pure olive oil. In other words, Aaron was to take care of this thing. It requires attention. It isn’t just something that you turn on and you leave it and you can just walk away and forget about it. No, it requires somebody attending this thing, watching this thing all the time; it has to be constantly watched. The word always and the word continually mean the same thing, don’t they? Amen. All right, now let us go back to Exodus again, Chapter 30. I was quite surprised – no I shouldn’t say that I was surprised — I was delighted. I was delighted to see again the relationship between the lampstand and the golden altar. Do you understand that in order to do the business at the golden altar you have to have fire. Am I right? You have to have something to burn the incense. Where are you going to get the fire? If you don’t have holy fire in the outer court, if your lamps have gone out, are you listening to me? You are not going to be able to do any business at the golden altar. If you can’t do business at the golden altar, how are you going to get through the veil to get into the holy of holies? So what I am hearing God say is that we are in trouble? I believe that is what I am hearing. I believe that is why God gave me the dream, to tell you that we are in trouble, but also that we need to do something about it. We need to bring the holy fire back into the house of God. What is he doing to the lamps? He is dressing the lamps. In other words, he is taking care of the wick, he is examining the supply of oil in the lamps. He is adjusting things that need to be adjusted. Every one of these lamps need to burn in such a manner that the flame ascends – not just a little sputter, sputter, sputter. Haven’t you seen some of these old fashioned lamps where the wick isn’t in the right position and it seems to be going out of oil and it sputters, sputters, sputters. That is not the way God wanted it to burn. So Aaron is to come in and every morning he is to take care of the lamp and the golden altar of incense. Okay. 9 “Ye shall offer no strange incense thereon, nor burnt sacrifice, nor meat offering; neither shall ye pour drink offering thereon. The golden altar is clearly a different altar from the brazen altar. Now at the brazen altar they did burnt offerings, they did sin offerings and they did trespass offerings. It was out here in the outer court that they did these other things. And they did their drink offering out there also. What is incense representative of? It is the soul that we are giving to God. In other words, here we are coming again confirming some things that Brother Chijioke brought again this afternoon. God wants our soul and He wants it in a pure form. Hallelujah. All right, now, let me see. “Ye shall offer no strange…offering”. Well let’s read the 10th verse too since it goes with the other instructions. So there we see the picture of the golden altar and how it relates so closely with the lampstand. It was a standard thing for Aaron. Now what has happened here is that this is the ignition by God. Can I use that word, ignition? I don’t know what other word to use. The lighting of it had to be holy. So we come down here to the next chapter. You see here is fire coming out of the Lord, but it is not the kind of fire that is going to light the outer court sacrifice, or the golden altar. Now do you understand? This is the first time. When we are back here in the books of Moses we find first time things happening and the dealing of God. Now brethren I could say and I can show you from the Word that this kind of thing probably happened again. We are going to get over into Samuel and I think Brother Chijioke even mentioned it. This fire had gone out already by the time we got to Samuel. I’ll read you that in a little bit. In other words, God didn’t strike down men everywhere along the line when it went out and they brought some other kind of fire in to light it. And the man didn’t die. The first time that the man picked up sticks on the Sabbath day and violated the Sabbath day, he got stoned. I can’t believe that that is the last time that a man violated the Sabbath, and I don’t believe that every man got stoned. People are still doing things, violating the same spiritual principles today. They are not dying in the natural, but they may be dying spiritually. But you see this is the first time occurrence and God’s dealing. Take a look for instance at Achan. Men have stolen things that belong to God since then and they didn’t all get publicly stoned. Okay. What was the problem with Achan, by the way? It was his independence and it affected the whole body of Christ. What did God say to Joshua when he inquired? God didn’t just say, “Well one of your men,” God said, “the whole people have sinned”. Doesn’t this put the fear of God in you? Especially when we consider that Nadab and Abihu must have been in complicity in this thing. Let me propose the question to you that came to me. Did that question come to you? When I read the procedure for moving, they had to take these pieces of furniture, wrap them in badger skins. Nobody except the certain Levites were allowed to touch these things under the control of Ithamar, who I recall was in charge of that. You can’t transport these lamps wrapped in badger skins while they are still burning. How did they deal with it? Do you have the answer for me? I believe I have an answer and the answer kind of came to me with the story of Abraham and Isaac going up mount Moriah. No, he didn’t have a little piece of flint with him, he didn’t have that. I believe he had a clay pot in which he had put the hot coals from a fire from home carried with some kind of a string or rope attached to it that wasn’t going to burn and they would carry this pot of fire (hot coals). I believe that this is what they did when they moved the tabernacle. The tabernacle moved often. So they would take the holy fire from the outer court. You see it was originated in the outer court. Isn’t this interesting by the way; that we depended upon the fire of the outer court to carry on the business of the holy place. There is supposed to be a progression of spiritual life that moves from the outer court to the holy place. So they would take the hot coals from the outer court, put it in some kind of a holy container that they had and they would then carry it to the next site. They would then use those hot coals to ignite another fire. By the way, that is what I would do with my wood stove if I could get away with it. I would try to get enough burning before I go to bed so that there is some nice coals there yet in the morning. If you can keep the same thing going it is a lot less hassle to get a fire going. You notice I read this other verse here and it said something about the snuff dishes and the tongs. These things had to be for the handling of the hot coals. Now you will notice and again, you can enlighten me. You have probably studied these censers and you probably know more detail about how they work. But I notice that Nadab and Abihu apparently used the same censers to carry the fire, but they carried it in from somewhere else. I’m not sure what these sensors looked like. I suppose they were little receptacles that hung on a chain or something like that. Apparently the priests were meant to go to the outer court with the tongs, put the coals in the censor, then bring it in to the golden altar and/or use it for whatever attention they needed to give to the lamps in the holy place. Now the other question that came to me was, “What about wood?” because you are not allowed to have wood in the holy place. Do you understand what I am saying? But you see the coals in the holy place; I don’t believe the raw wood can come in. Once the fire has touched these coals and they are hot, basically they become hot charcoal. You have to have a source of fire, but God doesn’t want any wood to show in the holy place. So this is no longer considered wood, it is now considered fire and it is covered by gold. Amen. It has been changed by the fire. So what is the picture here? What is the picture insofar as we can apply to the church business today? In my dream the holy fire of the outer court had gone out a long time ago. Nobody could depend on holy fire from that place anymore. So they were depending upon the fire that they could keep going now in the holy place, strictly the holy place, and specifically the lamps that were burning. This means that “we are out of oil and our lamps aren’t burning”. Who are they? They are foolish virgins. Now is it your intention to be a foolish virgin, holy place church? The foolish virgins may say that they are holy place people; “we believe the same things as the wise virgins”. Come on. The foolish and the wise, they hung around together. They knew each other. They had communion with one another. When the darkness came, the foolish went to their friends, the wise virgins. How did they know the wise ones had oil burning and that they didn’t? What evidence did they have? You know we are not talking about natural lamps now. It is a spiritual picture. If it is midnight, if it is dark, if hell is breaking out everywhere on earth, tribulation, trials, what have you and you look around and you see that somebody is making it. Somebody is living in victory. Amen. Somebody is getting their prayers answered and they are overcoming. Hallelujah. I hadn’t thought about it. But as I think about it I think it is saying it has happened, not saying it is going to happen. In my dream it had happened. Okay. So there needs to be found some fire somewhere. We need to be bringing that fire together as we gather as God’s people. Listen, am I telling fables? I have been talking to people from different fellowships, just listening to them. I’ll say that for New York. Our fellowship is in trouble too. I’m not satisfied that we have the light that I want to have. I am not going to make a definite statement about yours, but if I hear right what people are saying, they are saying that we are all in trouble. What happened to this lamp in Israel historically? Over the years I believe that it began to go out. I believe that they took on a different order of their spiritual life. We know that they moved the tabernacle across the Jordan River, and things began to change somewhat after they crossed the Jordan. They had kept observance going for forty years in the wilderness. During the time of Judges we began to lose track of what was happening to the tabernacle. But by the time we get to 1 Samuel we can begin to try to draw a picture of what was happening in the days of Samuel and Eli. How many of you believe that the Word of the Lord is getting scarce? By that I mean the holy fire anointed Word of God is becoming infrequent? Amen. This is a serious prophesy. I believe I would pay attention, if I heard a prophesy like this. What did Eli do about it? Seriously Eli, you could do something about it. Eli, you have an opportunity. I don’t know what kind of pressure he thought he was under. I don’t know what these sons, Hophni and Phineas, had over him. They were priests and he was the chief priest. He had the ability (shall I say) to fire them. What were these young priests doing? For one thing they were committing adultery right there with women who hung around the tabernacle. They were also greedy and took more of their share of the offerings. You know, you can trace the word of that unnamed prophet right on down through the life of David. Everything that that man said happened, everything. By the way, Eli was of the line of Ithamar. The other line was of his brother, Eleazar. And God had said to Eleazor’s son Phineas, “You are going to have an everlasting priesthood” because of how he dealt so decisively against Israel’s sin on the plains of Moab. I can’t prove it, line upon line, but I believe that there is enough evidence even in the genealogy of Jesus Christ that that same blood line came in to Jesus Christ through Mary. I believe that she inherited that Eleazar and Phineas blood line as well as that of David. There is enough evidence that her cousins, Zachariah the priest and his wife Elizabeth were close relatives. So we are seeing the spiritual condition of the people of God at that time. Now this is ancient English language no longer in common use, “Ere the lamp”. I looked it up, I still can’t figure out the exact meaning, but I think what it is saying is that they were letting the lamp go out at night. They just let it go out, no problem. Just before the lamp went out that night, Samuel was laid down in his bed to sleep. The other thing I am wondering about too is that there was no mention of a veil. Was Samuel just sleeping somewhere near to the lampstand in the holy place? They apparently didn’t have the same structure here that they had had in the wilderness. Neither did they have the same presence of God. Can I give you more evidence? It wouldn’t have mattered if they had a veil, or if they didn’t have a veil, because if they could take that ark out into the field of battle and the Philistines could steal it and get away with it, where had the presence of God gone? If the presence of God was so strong in the days of Moses that just these two priests coming in with the wrong kind of fire in their censors would be instantly smitten dead by the fire of God; then how could they get away with carrying the ark out into the field of battle to use it as a weapon. They had to have taken it out of the tabernacle, from whatever structure it was. And it definitely didn’t belong out in the field. I don’t see that they had Levites carrying it, had it covered with badger skins or anything else like that to keep it people from curiously seeing it. The church was in terrible condition. Then the Philistines (the unrighteous people of the world) got hold of it. Well yes, God did punish the Philistines, but He didn’t strike them all dead. Uzza didn’t get struck dead just for looking at it. So anyway, things were in a bad state of affairs. In 2 Chronicles we are going to see the second lighting of the fire. God lit the fire in the first “temple” (the tabernacle in the wilderness) in the days of Moses and Aaron. So in the he second tabernacle, now called the temple of Solomon, God again lit the fire. And we are going to see later here how God lit the fire again in the third one and the final temple, a spiritual house of God’s people. Okay, so for now let’s go back in 2 Chronicles Chapter 5 and this is the dedication of Solomon’s temple. So they have the Ark of the Covenant and I don’t know what other pieces of original furniture that they have, but at least they have the ark. So there was a sanctification here of the priests. They were made holy. They were washed, they were clean, and they were dedicated to the Lord. Everything was put in order in their life and in their outward expression as well. Okay. It sounds almost word for word like it happened in the days of Moses, doesn’t it. Amen. It sounds very different than in the days of Eli, doesn’t it. What had happened to the holy place church at the time of Hezekiah? It had gotten polluted, neglected, and filthy. There were things in the temple that didn’t belong in there. And in the days of Jesus it was the same situation. The temple had become polluted. There were money changers, animals, beasts and corrupt men in the temple. Do you want a relaxed easygoing God that doesn’t care about what happens in the holy place? Turn your back on Him and He will leave. He will leave and at this time He had already left. The lamps were gone out by the time of Hezekiah. God had lit the fire in the days of Solomon and it had gone out sometime during the days of idolatry and rebellious kings before Hezekiah. They took it all out and dumped it into a brook, the things that didn’t belong there in the house of God. Now, they kept the feast, they kept the Passover and God was pleased. But God didn’t light the fire again. They probably had a fire. They brought another fire in. They lit their altar, they lit their lamps, but it wasn’t lit by God and nobody was struck dead. But it wasn’t going to be the same. Whatever Hezekiah had done now, this carried on up until the time of Jesus. It waxed and it waned I’m sure. It surely went out during the Babylonian captivity and the destruction of Jerusalem by Nebudchadneezer. I’m sure it was on and off, on and off. But there would be no more lighting of the fire by God until – until the 2nd Chapter of Acts. Before I go there let me read Leviticus Chapter 6, in case you are wondering whether the outer court brazen altar was ever allowed to go out. No, it was not supposed to go out either. Now what was the source of fuel? Wood. What does God like to do with wood? Consume it. What does wood represent? Flesh, humanity. God wants to burn the humanity’s soulish flesh. Do you remember the last Word that Brother Cec brought by internet? The Red Heifer. I remember clearly as I can even now hear him say it when he brought it on the broadcast. He talked about the amount of fire that we are going to endure in our life and in tribulation. There are two things that cause fire. One is the amount of fuel and the lighting fire of that fuel to burn it. “How hot is the fire going to be in your tribulation? That depends on how much wood you have got, how much fuel you have got.” The fire will touch every man on earth. It behooves us to allow God to burn it off as He gets to it. If we fight and resist, as Brother was talking about resisting the Spirit. If you resist until the very last thing and finally say, “Okay God, take care of it,” what kind of a fire you are going to have. Why not let Him burn off a little today and a little more tomorrow and a little more next week and just keep burning it off? I think I can take that a lot easier than one great big massive tribulation fire at the end. and — Oh my! The other thing that comes to me here, before we get to the last ignition, is the wood. I’m thinking about the life in the wilderness. I’m thinking about the picture in my mind of this wilderness. It is not a forest. Am I right? It is a desert. What do you know about deserts? There aren’t many trees there. I see pictures of north Africa, and I have seen such as the Acacia tree, the thorny little trees that giraffes and elephants like to eat sometimes. But they are kind of sparse out there. I have seen a picture of an elephant pushing one over every now and then so that he can get the leaves of it. Rita and I were reading in Leviticus. We were reading about the sacrifice. This man brought three cows and this man brought five lambs. They were coming all the time it seems. What kind of a fire did they have to have to take care of these burnt offerings? I know they didn’t all get completely burnt up, but some of them did. Some of them got burnt completely to ashes. I know what it takes. I burn wood; Gordon, Sandy burn wood. I know some of you do. I know the store of cords that are required to take me through the winter. That is just the winter, you know that is eight months (sometimes a little more) that we need up there in New York. It starts again in September and it ends in May. But for us it requires effort and labor; brethren, outer court activity requires labor, works. Are we surprised? You see, this kind of strenuous labor doesn’t go on in the holy place. This kind of sweating works and labor just goes on in the outer court to get the fire and to keep that fire going. Men had to bring piles of wood into that place and somebody had to be out there hunting for wood all the time. Maybe this is one reason why they moved all the time, so they could get a new supply of wood. I’m just thinking of the practical things, because I think these practical things affect the spiritual picture of what we are talking about. You know, somebody was expressing to me the other day how the outer court Christians are so dedicated and labor so with the things that they do. These people that put on the exhibition or presentation that you took the bus load of brethren to over in the neighboring stare a few weeks ago. These people put a lot of work into that, a lot of labor and they do it with all their heart. Yes, with their heart. I have to believe that to keep this fire going somebody out there had to put in a lot of time. And all it takes is some neglect and it is gone. Now we are probably not getting and holy (original ignition) fire anymore from the outer court, so we have to maintain what God has given us at the golden lampstand. I think we need to take seriously what God has said. What did it say in Malachi? Somebody was quoting from Malachi. What was the purpose of the sons of Levi? Was it not to bring them to where they could offer an acceptable sacrifice. Isn’t that what it says? Let me read it. We have been in Malachi several times already. What does He want out of the sons of Levi? By the way, is it okay to call ourselves “sons of Levi”? Are we not spiritual sons of Levi? Does anybody have a problem with that? Spiritual sons of Levi, not natural sons, as our Brother pointed out clearly. We don’t trace our geneological ancestry back to Levi. But there is a spiritual picture here. God is talking to the spiritual sons of Levi. I believe He is talking to holy place people. Amen. Where did you see that picture of one accord? Back in the days of Solomon, the Levites, the priests, the trumpeters, they were all of one accord. There was oneness. What is missing in the church today? Unity. No, we are not going to find unity by ecumenicism. That is not unity. Amen. They were united around God’s order. I can’t unite with somebody who is out of God’s order and not even under the blood. I can’t do it. I’m sorry, I can’t do it. It is the wrong kind of unity. It is false prophet, antichrist unity. Amen. It is as bad a name as you can get. It says that “when the day of Pentecost was fully come”, there is an appointed time of God. It was fully come. I believe that God has a message for the church in this hour. I believe that God is going to tell us more. I believe brethren, that when we leave here we need to set our hearts that we are going to do what God is asking of us. We can’t let the fire go out. You know God has a fire somewhere, if we are not going to be the people of God, if we are not going to be the people baptized in fire, He is going to find another people, but He is going to find a people. Somewhere out there among God’s people there is the fire. That was clear in my dream. That is what the priests were discussing.